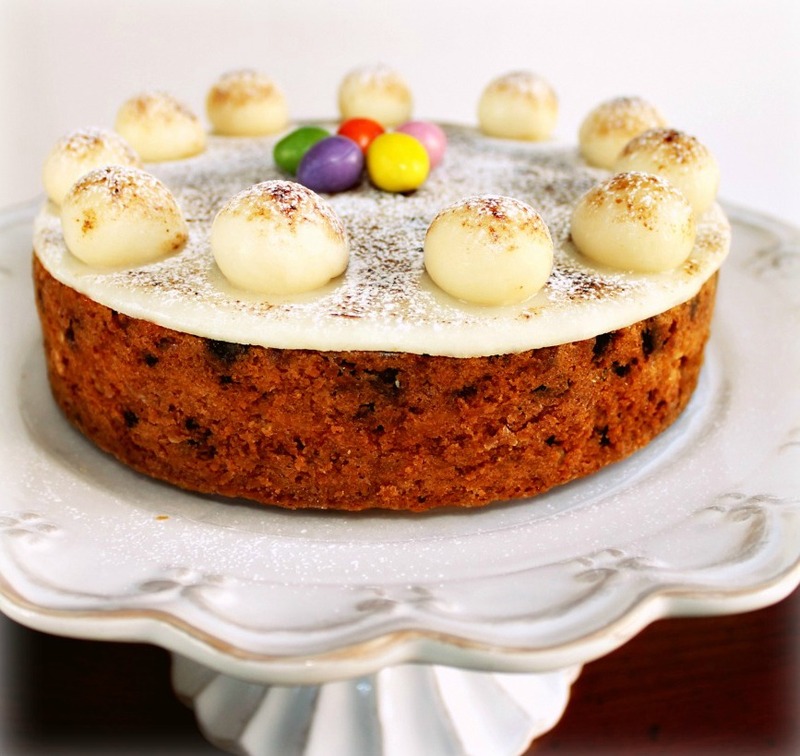 Simnel Cake is traditionally baked at Easter and has 11 eggs on top made from marzipan, signifying the 11 Apostles. Judas having betrayed our Lord shortly before his crucifixion, does not merit an egg. In our house it was always baked at the start of Lent, was wrapped in brandy soaked muslin so that it had time to mature. While most people use store bought marzipan, made usually from almond flavoured apricot kernels, my grandmother used to buy ground almonds in a tin which you opened with a tin opener, I cant remember the brand name, but it was imported – British. I asked my friend Colleen Grove, the uber baker from Fish Hoek to bake one for me. She took some stunning photographs of it too! Colleen has a blog of her own, do visit it. She is a sensational baker, and at times has baked over 250 Christmas cakes for friends. Do go to her blog – www.browniegirlblog.com. 1 egg – for brushing over the cake before grilling. Prepare a 20cm cake tine by lining it, bottom and sides, with greaseproof or silicone paper. In a large glass bowl mix the sugar and the ground almonds. Beat the eggs and use only enough to give the paste a soft texture. Flavour with the vanilla essence and knead gently for about a minute. Set aside. You will need to roll about a third of the weight of the almond paste to make a circle 18cm in diameter which will go into the centre of the cake. The remainder will be used for half for another circle to place on top, and half to make the Apostle eggs. Preheat oven to 140C. To make the cake mixture, in the bowl of a food mixer, cream the butter and then add the sugar and beat together until pale in colour and light in texture. Sift together the flour, spices and salt. Add the eggs one at a time and add about a third of the flour mixture with each egg as this helps prevent curdling. Add the fruits, the mixed peel the grated rinds and stir together to mix well. Spoon half of the batter into the prepared cake tin. Level it off and then put the circle of marzipan on top. Spoon the rest of the batter on top and smooth over allowing a bit of a dent in the middle so that the cake ends up with a flat top. Bake for 105 minutes, insert metal skewer into the middle. If it comes out clean, the cake is baked. If not test after a further ten minutes. Remove the cake from the oven. Allow to cool in the tin for about 15 minutes, then turn out onto a cake rack to cool completely. Now when the cake is completely cool, remove it from the greaseproof or silicone paper. If it is slightly domed, put it upside down on a baking tray. Set your oven’s grill on high. Heat the apricot jam and brush over the top of the cake. Using half of the remaining marzipan, roll it out into a circle and place it carefully on top of the cake. With the remaining marzipan, roll out 11 small egg shaped balls and place them round the edge. Brush the marzipan and the eggs with beaten egg and set in the oven to brown gently, watching all the time for about 1 – 2 minutes, depending on the heat of your grill. Or else, use a blow torch to brown it. Garnish with some little candy or small chocolate Easter eggs. And do place a little fluffy chicken on top.